Dissociative séance sessions. 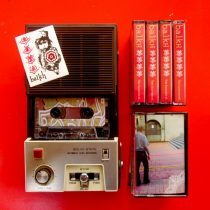 Cassette released by !Mondo Anthem! Works of shifting images, uncertain sounds, and transitional environments. Completed in February of 2019, Transfiguration thru Religious Technologies is a 4:50 hour composition of moving image and soundscape. While referencing the lure of engineered dogma and incentive induced psychological marketing, it also serves as a deep meditation on transcendence. This time-based media work will best experienced as a projected video with sound amplified.